It's Monday again....how is that a possibility?! I also can't believe we are already in June- it's finally warm here in Rhode Island and I am in my element. This is why we suffer through all those unbearable cold months! Let's start with the two items I'm decluttering. Lately my skin has been a huge issue and both of these face lotions just made it worse. I have super dry and sensitive skin and both of these made my skin super red. I just don't have time for products that make my skin worse so both of these are getting decluttered. I just placed a Sephora order for a product that I'm hoping will solve my skin problems...fingers crossed. 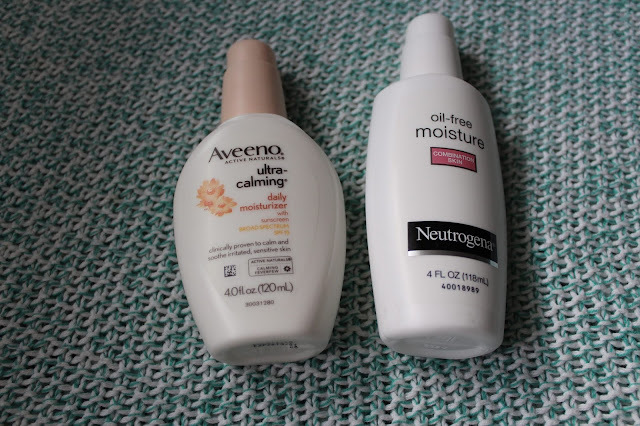 I'm calling the Neutrogena and Aveeno products duds- see ya never. Next up, two laundry products. I like these smaller containers since I'm hauling all our laundry to the coin operated machine in the basement. I regularly purchase Purex since that's what I grew up using and I do really like it. I would definitely repurchase this in the future. Xtra is something I use when I get it for free- it's just okay not something I would want to spend money on. I love my cleaning products! I finished up this Pledge floor care cleaner which I would repurchase but I'm planning on buying something different this time. The Method Antibac toilet cleaner is nice and I would repurchase it again. The Mrs Meyers multi-surface spray in Mint is amazing and smells incredible. 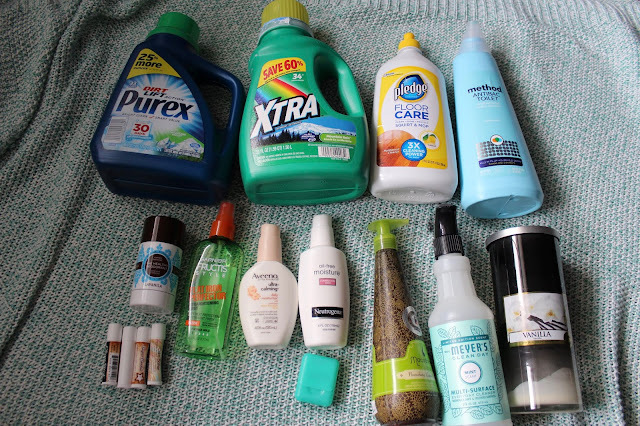 I have been loving Mrs Meyers scents and have been attempting to try out as many as possible so you will be seeing lots of different ones pop up in my empties! I finished up one candle this month from Bath and Body Works in the scent vanilla. I picked this up while at HomeGoods since we completely ran out of candles! I know, I know I stockpile like crazy but I actually went through my entire stash. I will be hitting up the Bath and Body Works semi-annual sale this week to stock up on candles and a few other items. Anyways, this candle was nice but I always find that Yankee Candles don't have as much of a scent throw as other candles do. They tend to smell really good inside the container but once you light them it's hard to smell them throughout your space- such a bummer. I wouldn't repurchase this one again because the size was just ridiculously tall and I wasn't getting much scent out of it at all. I finished two hair products this month. The first is the Macadamia Nourishing Leave In Cream which I have been working on forever! I put this in my hair when it's wet after my shower and it keeps it moisturized while it dries. I love the smell of these products. The second product is Garnier Fructis Flat Iron Perfection which I did really like. I bought it on a recommendation and thought it did a great job of protecting my hair while I straightened it. I would repurchase since it's a nice cheap option for a protecting spray. I should also mention I finished up samples of shampoo and conditioner while away for a weekend and lost the packets that I was going to bring home to share with you. I guess those were the best things to lose out of everything I brought with me but I was still bummed I couldn't share them with you guys! I love Lavanilla's Healthy Deodorants. This one is in coconut vanilla and I really liked it! I did try out a new deodorant though and I like it just as much as these so I'm not sure which one I am going to stick with...I love that there are finally healthy deodorants that work great and are all natural! I finished four chapsticks this month. Three were sugar cookie and one was cake batter. Cake batter is still my ultimate favorite and I'm getting awful close to the end of my stash. It might be just about time to replenish! Lastly, I finished my floss that I keep in my purse. Kind of a lame empty but I thought it was worth mentioning. This is the Glide floss and I like keeping a container in my bag just in case! What products did you finish up in May?